To kick off 2018, I’m celebrating some of Roller Derby Athletics’ favourite athletes from the past year! These skaters worked their butts off, were super consistent, and really stepped up their game this past year. All of the RDA Coaches and I are super proud of these #rdaallstars! 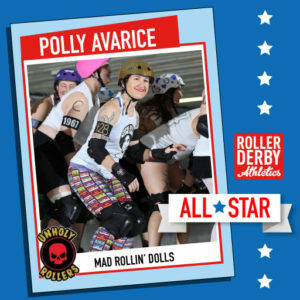 Introducing: Polly Avarice, from the Mad Rollin’ Dolls – Unholy Rollers! 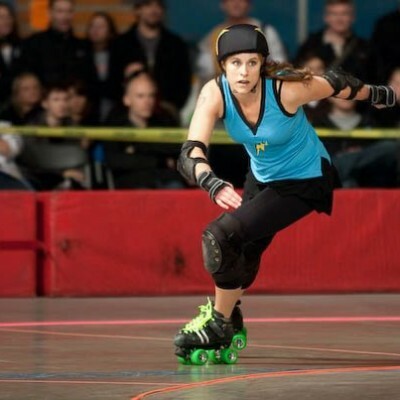 Polly worked doggedly to pass all her skills and get draft-ready in MRD’s Wreckers rec league while she was also being super consistent with her workouts with Roller Derby Athletics! This is one rookie we can’t wait to see grow into her new home team role during her first season in 2018. What do you get up to when you’re not playing derby? I *think* about derby! Just kidding (sort of). I do communications and fundraising for a fantastic nonprofit, NCCD, as my job. My non-derby hobbies include reading and playing racquetball with my lovely derby wife. What are you working towards in derby right now? I’m a rookie, so I’m working on learning to be a good contributor to my team on and off the track. Any big successes or milestones for you in derby recently? Getting drafted in October was a big one! I’m so thrilled to be part of this team. How has off-skate training contributed to your derby experience? Off-skates training makes me stronger and more confident. It’s just one of the many facets you have to pay attention to if you want to excel, but it’s a big one. Anything else you want to tell the world about your derby or training experience this year? I always planned to do something really big for my 40th birthday. People I know have climbed mountains, taken amazing trips, had awesome parties. My 40th is a week before my first bout, and getting to play derby as part of the best team in the universe is about as cool a birthday present as I can imagine. Happy 40th Birthday, Polly! We look forward to helping you through a fabulous future with your new team!